I set my stall out at the start of 2018 to try and spend more time on my feet – and not just more time but more productive time. Anyone who follows me on Strava will know that I do spend plenty of time on my feet. But a lot of that time is walking rather than running and, although that helps with general fitness, it is sometimes too easy to clock the miles up in a pair of walking boots rather than lacing up some trainers and getting on with it. To prove that point, I started keeping a good record of things in 2015 and since then the splits between walking and running have been, and I apologise to those who don't like kilometres, this: 2015: run 852, walk 1,199; 2016: run 701, walk 1,955; 2017: run 1,048, walk 1,139; 2018: run 1,670, walk 1,047. 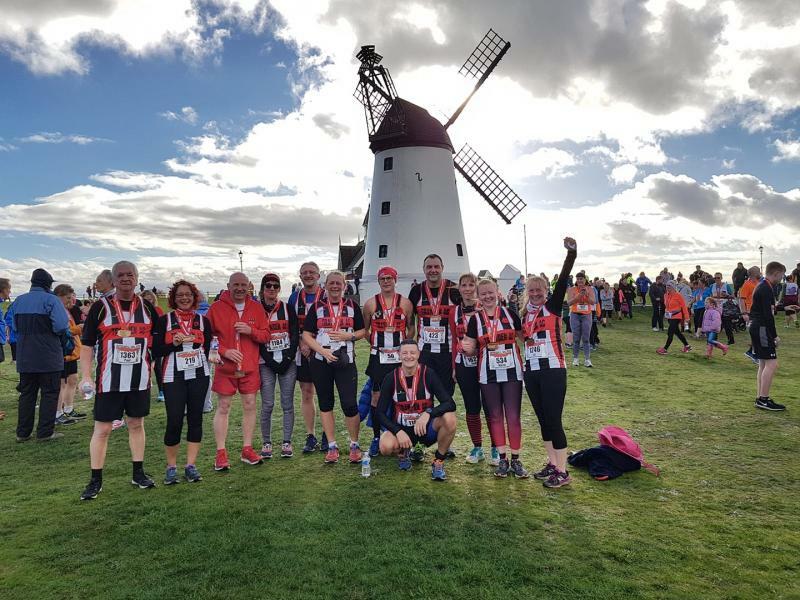 I had finished 2017 well, signing off with a nice PB of 50:22 in the Windmill 10K, and I was determined that I would get plenty more PBs in 2018. But how was I going to go about it, without letting running take over my life? In essence, I like a challenge. And so I decided on three. The first was to take part in RED January, and by the time you read this I will be well underway doing this all over again. The second was to try and cover five million steps in the year. And the third was to run 1,000 miles (or 1,609 kilometres in my case) in the year. There was, in fact, a fourth challenge set rather unrealistically by Graham Denney and although I got about 350 miles closer to finishing than he did, we were both way off…so we'll just ignore that one! RED January, it doesn't take long to type, but boy does it make for a long month! Several members of Trawden AC, many from the progression sessions, along with a good number of Pendle parkrunners took on Run Every Day January. And I applaud each and every one of them because I know how tough it was. A fellow Humbug posted something about the challenge on Facebook. It is a challenge run to support Mind, the mental health charity. I signed up thinking it would be a blast as it is such a long time since I did any "streak" running. All that is required to fulfil the mission is a run every day, just a mile, that'll do it. Where's the problem? Problem? Several. Old age, living on the side of a hill (I hate hills), snow, hail, sleet...oh and the obvious fact that the challenge starts on 1st January with a 99% chance that I won't be able to force myself out of bed, never mind actually do any running! But the T-shirt arrived in time and I joined the challenge with three friends so that we could egg each other on. In my head I set myself a target of 100 miles, but I actually work in kilometres so I needed 161 of them. Why work in kilometres? The numbers are bigger! New Year's Day dawned, although I wasn't really aware of said occurrence due to a face full of Prosecco, beer and red wine the night before. I managed to lever myself out of bed in time to force feed myself some pie and peas in the local pub, washed down with a lovely drop of Coca Cola (other brands are available) before heading off to watch the footie at The Turf. I hadn't really planned when that day's run was going to take place. And then, for reasons best known to someone else but not me, I tried to run home from the match. In a full winter coat, jeans and "normal" shoes I managed just over two kilometres of it and then gave in. Bit of a cheat, maybe, but the challenge was underway. The day after came the first real run and from my house it involved battling up Kings Causeway on a 5K loop. I hate hills, but this route featured several times during the month as it is fairly well lit. Day 3, and as I hate running uphill so much I decided to vary the previous day's route by adding Reedley Road in as well. Ouch! Short on time for the next two days, I made quick visits to the track at Seedhill and then did a Pendle parkrun tailrun. The first week ended with one of my favourite walks being turned into a run. From home it was downhill all the way for the first couple of kilometres and then hit Rowley Lake, on to Worsthorne, across to Roggerham and then up to the top of Harle Syke. I may have mentioned that I hate hills, this one has an elevation gain of about 230 metres, so I decided not to do it again as I finished the first week with 42km racked up. 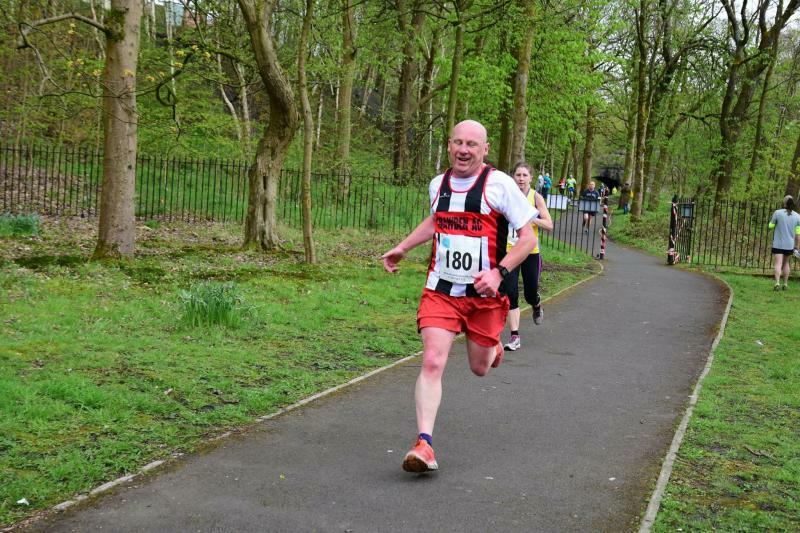 The second week settled into a routine of either track running or the Kings Causeway nonsense and ended with the East Lancashire Hospice 10k where I was delighted with a first-race-of-the-year time of 53:32. The second week totalled 49 kilometres and the 100 mile target looked straightforward enough. Week three started with a day at work and a 6pm meeting, meaning there was just time for a 5K blast around Seedhill in between the two. Then came the snow and Tuesday's run totalled just about 2.5K as I gave in to the slippery pavements and decided not to risk any broken bones. Wednesday and Thursday were monotonous loops around streets brightened, literally, by the ability to annoy my neighbours with the brightest head torch I have ever owned. Friday was a longer track run than normal, Saturday was parkrun and on Sunday, for reasons I still haven't fathomed, I took on the Rowley, Worsthorne, Roggerham loop again with visibility down to about 20 metres on the top road as a sleet storm decided to unleash itself on me. Another 42k week and it looked like I could take it easy for the rest of the month! 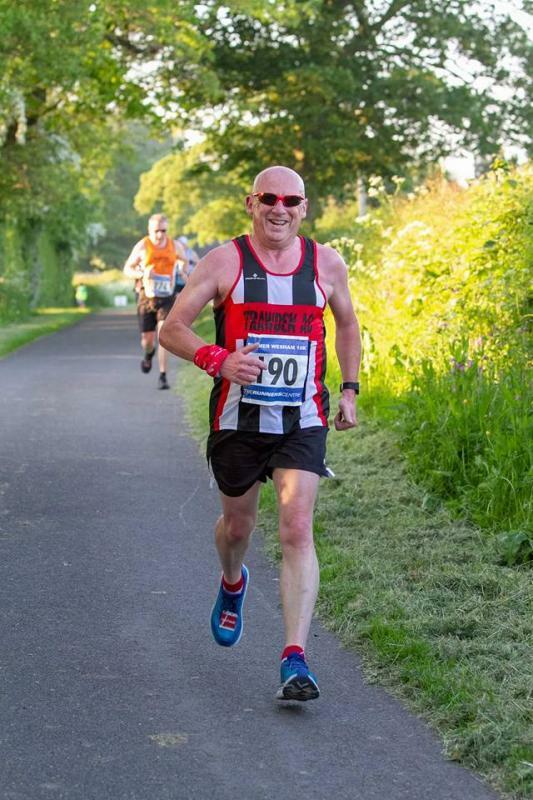 In fact I took it so easy that week four included my longest run of the month, 12.65km, another 10K run, a whinge-a-thon around Pendle parkrun as my tailrunner's job was stolen from me and I had to try and run it "properly", and three more Kings Causeway loops. Just so you don't think I missed a day, there was another trip to Seedhill – involving a little celebratory skip when I passed 100 miles for the month – as well. The final three days of the challenge started with a flying visit to Seedhill, a Kings Causeway loop and a 31st January 10K around Seedhill to round things off. Mission complete, 203km in the bag and a great feeling of accomplishment as I joined almost 30,000 other runners around the country in taking on, and completing, the challenge. I usually spend some of my training time on a treadmill but I didn't see one all month as my three so-called friends banned them from the challenge. The 203km is comfortably (!) the most distance I have covered in a month since first entering the world of Garmin ownership. It was never really about speed and never really about distance, it was all about lacing on the Hokas and getting on with it. I ran up Kings Causeway eight times, but I still don't like hills. 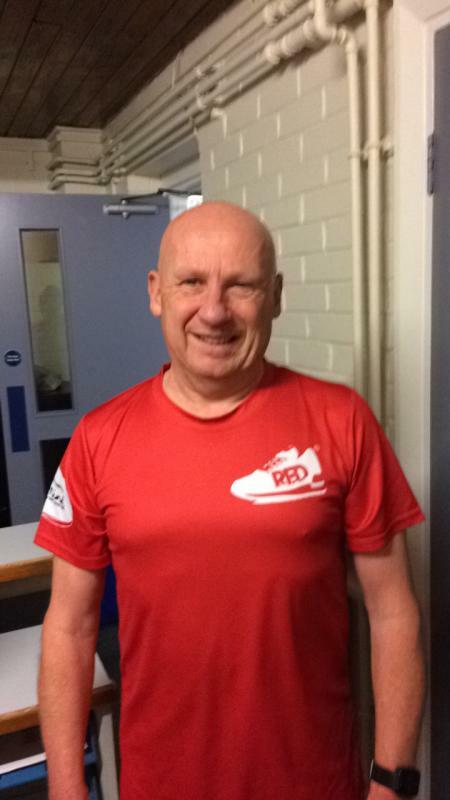 I completed about 220 laps of Seedhill and, the East Lancs Hospice race and parkruns apart, I did all of it by myself. There is deeply divided opinion about "streak" running. Runners of my age and ability are meant to run no more than five out of each seven days. Even Mo Farah gets a day off once a fortnight. My legs were aching horribly two weeks in, but by the end of the month my last two runs were my quickest 10K at Seedhill and my quickest Kings Causeway loop. Has it made me a better runner? 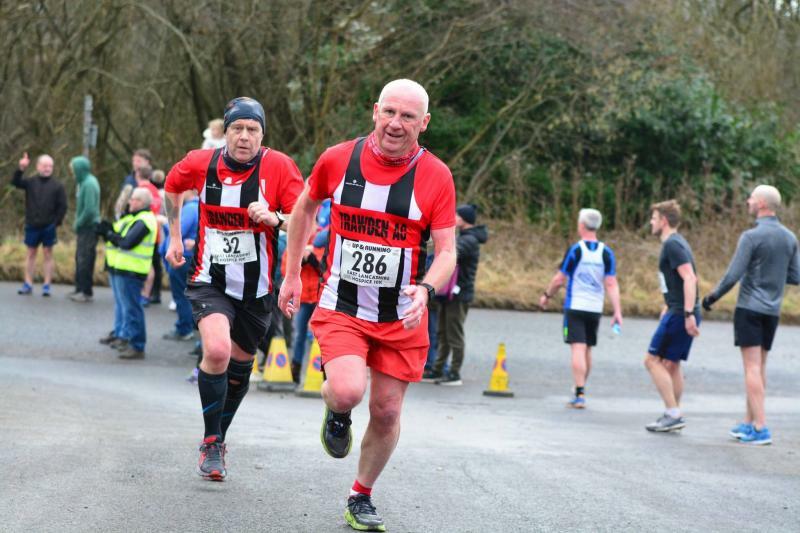 Who knows, only time will tell, but I have to say that the East Lancs Hospice race is the third quickest 10K I have run under race conditions since joining this wonderful club. There are lots of things I could say about doing a steps challenge, the first of which is you have a distinct advantage if you only have little legs! For instance, a 10K walk takes me about 14,000 steps. The next thing I can say is that you can rack the steps up in bigger numbers by walking rather than running. As I have said, a 10K walk takes me about 14,000 steps but my quickest 10K race (more about that later) took just 8,746. Walking is, therefore, more productive than running but as I had challenged myself to run more than I walk, I knew that I was in for an interesting test. To complete the 5,000,000 steps I needed to average 13,698 a day and, not wanting to take any chances, I reset the steps goal on my watch to 13,700! Before the start of the year I was averaging about 12,400 a day in the life of the current Garmin, so the game needed to by upped. Armed with a new spreadsheet, I made a column for every month and totalled up how many lots of 13,700 – i.e. how many days there were in each month – and got to work. To prove the point about running being less productive than walking for this sort of challenge, the only month I failed to hit the target was January, even though that was the month with the most running in it. Since then I clobbered the monthly total many times, getting over half a million steps in on no fewer than five months and even managing to beat the target by 3,000 steps in July when I spent the first two weeks on holiday and only managed to get any steps in at all by moving to a sunbed further away from the swim-up bar. Having caught up the missing thousands from January by the end of February, I actually got to the first million three days early, second million 17 days early; half-way 21 days early, three million 25 days early; four million 31 days early and completed the whole thing on 12th November rather than New Year's Eve. Many of you will know that, along with good friend Graham Denney, I embark on a couple of mammoth walks each year. This year's choices were the Ullswater Way, all 33.9 kilomtres of it, and the Panopticon Walk from Blackburn to Wycoller, a 55 kilometre trek which used up well over 70,000 steps and also signalled the end of my longest “streak” – 39 successive days of covering at least 13,700 steps. The biggest challenge for me in all of this is that a usual working day sees me arrive at my desk with just over 2,000 steps clocked up and leave the office some time later having only added another thousand or so. That means, weekends apart, I often have well over 10,000 steps to get in before having anything to eat at the end of the working day. Fitting all that in without letting the challenge completely take over my life was interesting, but the whole thing left me thinking that I should actually have set the target higher – 500,000 a month, perhaps – and then I wouldn't have put my feet up in December! In the end, I narrowly missed the December target and finished the year with 5,692,802 steps at a daily average of a fraction short of 15,600. I don't run enough and I certainly don't race enough and that's where this challenge came in. Armed with another spreadsheet with a monthly total assigned (number of days multiplied by 4.41km to arrive at the 1,609km required) I got to work on 1st January. Usually I would not log anything under 5K, but RED January meant I was going to have to make some exceptions. As detailed above, January gave me a flying start and I was about 65km in front of target by the end of it. Then came a disastrous trip to the eagerly-anticipated Pendle Beer Festival. Leather-soled shoes and a wooden floor made slippy by people wasting beer and spilling it made me slip slightly and tweak a calf muscle – honestly, it's all true! That brought to an end my running streak after 33 days, brought with it a five-day lay-off and snow, quite a lot of it, later in the month meant that I failed to hit my target miserably in February although I still finished the month about 25km ahead of the cumulative target. I managed to stay ahead of target throughout the year and then, with one eye on Christmas festivities, I decided to go for a mad November and that left me in a position to reach the goal with three weeks to spare. I did try to keep going, but “life” and a niggly glute which really needed a rest got in the way and I ended 2019 with 1,670km or 1,038 miles under my belt. There are lots of ways of putting 1,000 miles into perspective. Any way you want to look at it, it's a lot of miles. Some people do many, many more miles than that, some never get anywhere near it. Will I try and beat it in 2019? Who knows? As I said right at the start of this article, I like a challenge. Beating the 2018 total could be what I settle on – or I might just try something completely new. I only really run 10K races and half marathons, although I do like to compete at parkrun sometimes rather than grab the orange hi-vis and trundle round at the back of the field. So let's put things into perspective. At the end of 2017 my best Pendle parkrun was 28:50; my best Burnley parkrun was 26:00, by best 10K was 50:22 and my best half marathon stood at 1:58:01. The Pendle parkrun time was probably down to the fact I had previously only ever run it seriously about three times and when I did, I still sometimes forget not to stop for a chat with the other volunteers on my way round. There was plenty of room for improvement and three serious attempts later I had registered 27:15, 26:33 and 25:45, the latter made even better when the lovely Nicola Nuttall told me at the finish line: “Sometimes Ed, we forget just how fast you really are.” That remains the nicest thing anyone has ever said about my running! Burnley parkrun is a rare day out for me but I knew I was moving well at the start of April and went down to Towneley to give it a go. I hadn't realised it was pacers' week, but took advantage of it. I decided that if I stayed a yard in front of the 26 minute man all the way round I would be OK. I did just that for the first lap and then eased away from him to then catch the 25 minute pacer just before the final corner and the come up with a sprint finish (!) to register a massive new PB of 24:40. I enjoyed pacers' week so much, I decided to go again in May and set about beating the 25 minute guy again. 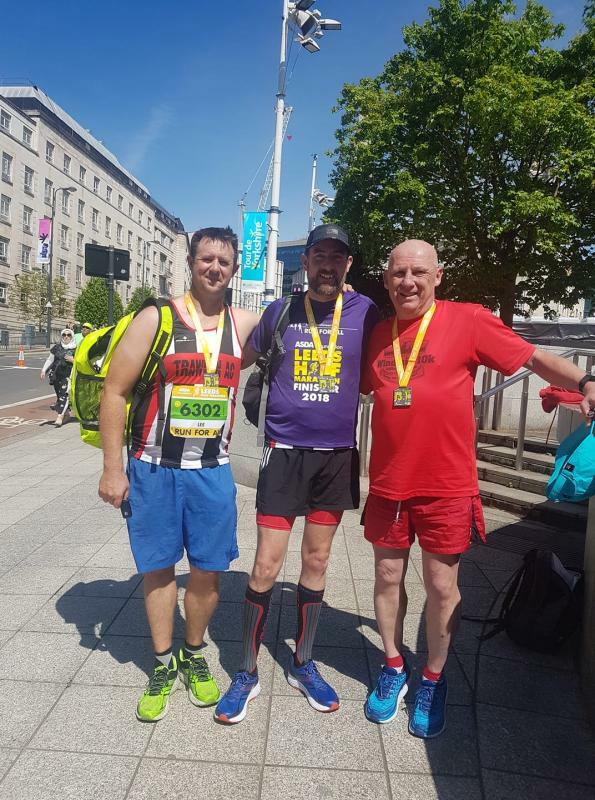 I ran with him for the first kilometre and then started to pull away from him finally finishing in 24:15 on the day that Paul Brown was running the ninth of his ten Windermere Marathons. I had promised him a fiver for every PB and was by now starting to regret it! Those were my only serious attempts at parkrun times all year and while I know there is room for improvement at Pendle, I am happy enough with the new Burnley time. Since I started running again my only half-marathons had been two visits to Manchester, one a complete disaster and the other a much better 1:58:01. I knew there was room for improvement, but not sure how much room. To find out I decided to start the year with an early-season half in Liverpool. This race had not much going for it, as it was the day after we lost an hour's sleep due to the clocks changing. Race time was 9am (or 8), Graham wanted to pick me up ot 7am (or 6) and that meant I had to get up at 6 (or 5), to say I was apprehensive would be an understatement, especially as I hadn't run anything like the distance for five months or so. But my body felt okay and I just went for it. All the splits were good and, apart from the long drag up the promenade, I never really felt tired. I crossed the finish line in 1:50:03 and instantly knew something was wrong. I checked and rechecked, but nothing I could do could find the missing 350 metres and so, in PB terms, it was a wasted effort – although I still sent Paul a fiver. The most annoying thing was that the pace I was running towards the end of the race would have brought me home well inside 1:52 for a six minute PB, in fact I could probably have recorded a new best time if I had done the missing 350 metres in forward rolls and cartwheels! I needed to get that one out of my system, but ended up waiting until the Leeds event in May, the first race of the year to leave me with a serious vest tan. 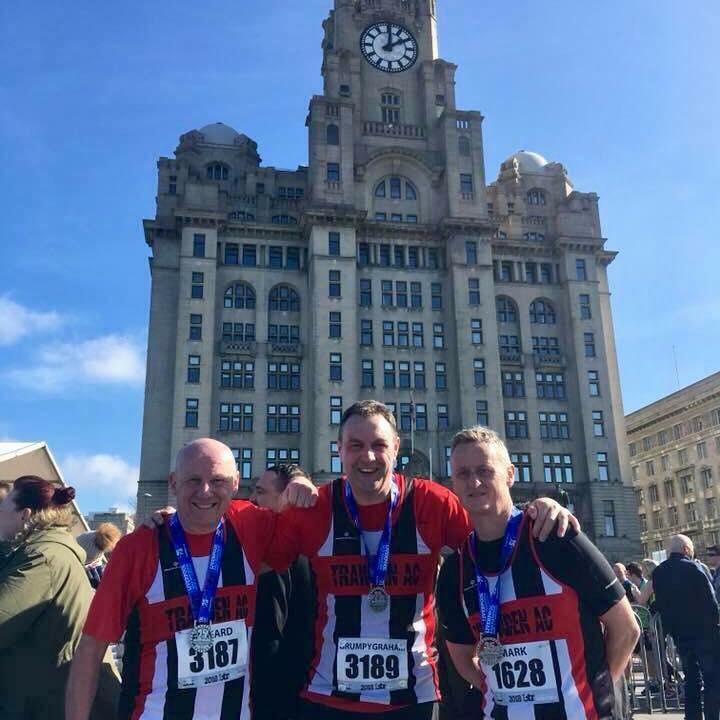 Those of you who don't know this Run For All event should bear in mind it is one that the chuckle brothers Ashley Eastwood and Gary Sutcliffe would describe as “flat”. It isn't. A lot of the first four miles are uphill, not serious hills like in our neck of the woods, but hilly enough to nag away with a couple of sharp inclines. You do get a long downhill stretch and later, the last four miles or so are rolling back into the city centre with a sharp uphill to finish. As always, I was doing maths in my head all the way round to make sure I got inside 1:58:01 and ended up with 1:56:17. I didn't mean to wait until the Manchester event for my next half marathon, but that was just the way it panned out. I knew the 5K splits I wanted for a new PB and was actually aiming for 1:52, the time I should have had at Liverpool. The first 5K was bang on, as was the second. Without realising it, I ran the next 5K far too quickly and that nearly ruined everything, but I managed to stay on my feet for a new PB of 1:55:45, but there is still room for improvement. So the parkruns sorted themselves out and I had twice set PBs in half marathons, but what about the 10K time? Before November 2017 my 10K PB was 54:16 set in Bury the year before…and then, from nowhere, I ran 50:22 and 50:26 in Lytham and Wesham respectively in the space of 13 days. I needed to know these weren't flukes, but needed the right events to do it. The East Lancs Hospice race was never going to be the right event, but 53:32 was a solid enough start for me. The Three Bridges race in Lancaster should have given me a chance, but I ran it all wrong. I set off at the pace I wanted and then it suddenly dawned on me what people were on about when mentioning “the steps” leading up to the canal from Ryelands Park. I could picture them, knew I would hate them and actually made the stupid decision to run like a four-year-old chasing an ice cream van to get to them. Game over and I wasn't even half-way round. I knew I had got it wrong and tried to make up all the lost time in the next 500 metres, game over again. I plugged away and tried to get a respectable time, finishing in 51:48 for the third best time of my veteran “career”. Like the East Lancs Hospice 10K, the Brun Valley Trail was never really going to be my sort of thing, but I did at least prove that I can get my Hokas dirty. I just wanted to beat my age (57) and finished in 54:43, so it wasn't all bad. Next up was a summer running of the Wesham event and I had high hopes of a good time. In the end heat and humidity got the better of me, but I managed 51:12 and things were back on track. My next two 10K races were meant to be in Wigan and Bury, both with PB potential, but unfortunate family circumstances ruled them out, leaving me with the City of Preston 10K to look forward to. It's a rare day that I take on a 10K without knowing the route, but that's what happened and I got it wrong again. I actually hit halfway in exactly 25 minutes and got all excited because I usually run negative splits and I started dreaming of sub-50, but the hill coming out of Avenham Park did for me and when we hit the long downhill stretch to reach the finish line I hadn't anything left in my legs and missed a season's best by a second. Realistically my best shot at it was going to be the Windmill 10K and I prepared perfectly for it. 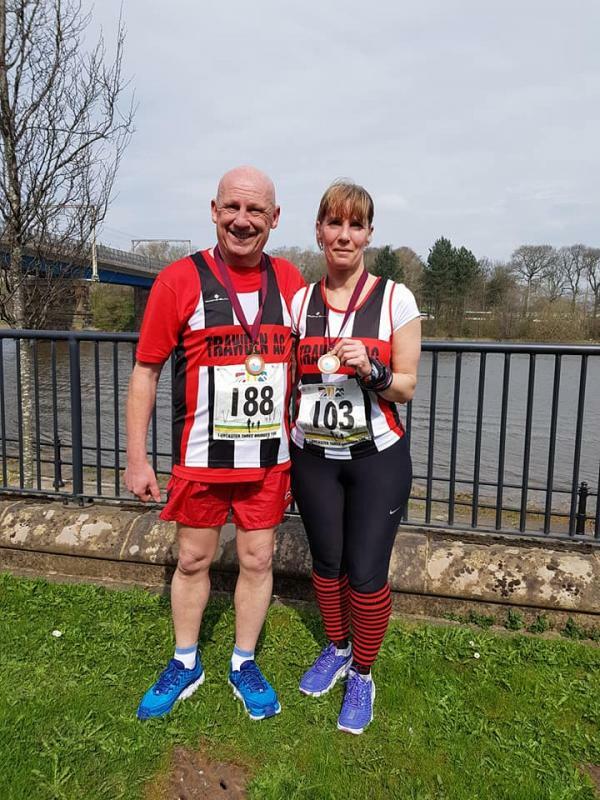 I tapered my runs, the lovely Carly gave me new legs the week before, I ate the right stuff and didn't have a drink for ten days before it – running did take over my life for a week and a half leading up to it. When I say I prepared for it perfectly, it's not quite true. The afternoon before I spent four hours arguing with some flat-pack furniture and I was absolutely knackered by the time I arrived in Lytham. Anyhow, I knew this was likely to be my last shot at it and went for my favourite race strategy: go for an emergency pit stop five minutes before race time, find yourself stuck somewhere near the 70 minute pacer and then work your way through the field! All I really wanted was a season's best time with the added incentive of knowing that it really is a PB course. All my splits were exactly where I wanted them. I wanted to be out in 26 minutes, leaving me just over 25 for a season's best. I turned in 25:45 and was moving easily and started to gradually move up a gear. At 7K I knew that I was going to have to fall over to not beat the 51:12 from Wesham, at 8K I decided that a PB might be possible and started to really go for it, and at 9K I dug out everything I had left for a final kilometre of 4:39 and a sparkly new PB of 50:10, the second 5K taking me 24:25 for a big negative split and my second best 5K time of the year. I was jumping for joy, the joy only slightly diminished by the fact that it measured 40 metres long and I had actually run the 10k in 49:57…never mind, there's always this year's event to dip under 50 minutes! I wanted to end the year a better runner than I started it and, with the type of running I do, the only way of measuring that is in PBs. Three at Pendle parkrun, two at Burnley parkrun, two (nearly three) at half marathon distances and my favourite, the new 10K PB which was the first time since I started running again that everything went just as I had planned it, the splits were right, the build up to the finish was right and I knew I hadn't left much out there. I know I can still run all the distances quicker and will continue to try and better them. But if you look at my Facebook profile it says…I am not the best runner ever, but I'm better than I was last year! It's still true and, as I approach my 58th birthday, I'll settle for that!